Ashbury derives its inspiration from 18th century transitional types such as Caslon and Baskerville. It is however not a revival but interprets formal aspects in a new and individual fashion. With a flowing outline, it remains warm and pleasant but assertive because of its solid strokeweights. Ashbury is very well equipped for a wide range of ambitious applications. 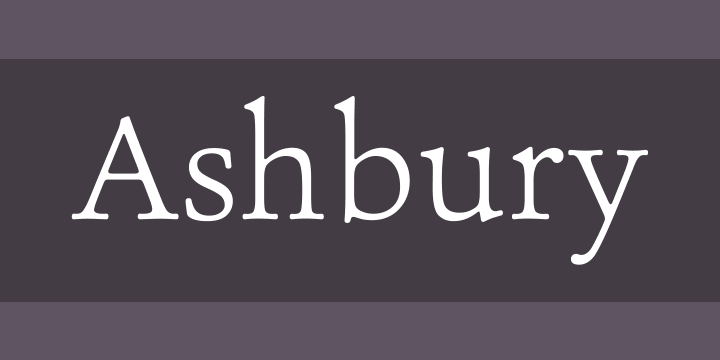 Ashbury comes in ten styles, in OpenType format and with extended language support for more than 40 languages. All weights contain small caps, swash capitals, standard and discretional ligatures, proportional lining figures, tabular lining figures, proportional old style figures, tabular old style figures, matching currency symbols, fraction- and scientific numerals.